In a stunning display of innovation and polish Microsoft demonstrated it’s new devices strategy yesterday. It’s already shown it’s almost brutal determination to establish itself as a device agnostic services business over the past year, delivering apps on competing platforms ahead of it’s own, time and time again and Azure is well established as an open services platform. But yesterday was all about showing how it’s devices strategy is starting to bloom. Where it’s market position is strong it’s producing nicely differentiated high end Surface line, where it can it’s identifying on underserved niches – like the high end fitness Band and HoloLens – and where it’s weak, like phones, it’s producing innovative high end options for the faithful and the enterprise, that really show off it’s universal app and productivity story. Crucially Microsoft now has devices that can capture the lucrative high end tablet and laptop markets, that Apple has been sucking all of the profit out of, and allowing it to get it’s devices into the hands of influencers and decision makers and enthusiasts. Apple has been roundly out-manoeuvred, by Microsoft’s upstart hardware division, a team that they delighted in mocking only a couple of years ago. While nothing is really ‘new’ in what they showed off, their execution over time has been excellent, a continuous track record of incremental innovation and attention to detail in the Surface line has established a strong brand and they’ve now leveraged that strength into the Surface Book, laptop optimised 2 in 1. Like everyone else I gasped when they pulled off the screen in the second showing of the video, a great bit of showmanship! Everything exiting that’s happening in IT now seems to be happening at Microsoft and while they might not be the only innovators in the market, their reach and depth is truly impressive. The contrast with Apple has to be made, where Apple is obsessively focused on industrial design and a few highly profitable market segments, they look ever more like a company who’s mission is making money. By contrast Microsoft’s broad capabilities seem much more human, focusing on people and their end to end productivity and entertainment needs, on providing choices, open platforms and open business practices. A company where making money comes as a side effect of doing good, the new Microsoft seems even more like a force for good in the world than Google does. Tim Cook on stage seems completely devoid of any vision for his products, simply repeating the stale “most powerful” “most beautiful” phrases again and again, although he clearly knows how to manage the business, Satya is a class apart. It’s still early days of course, but Satya Nadella’s turn around has been amazing to watch. Much of what’s good in Microsoft today must have been there under the leadership of Steve Ballmer years ago, bubbling below the surface, but Satya has set it free. He’s provided a unifying vision for the company, made the tough decisions, the investments and built a strong team. To some extent his strategy could be seen as a just as a reaction to the market situation he inherited, but that would be unfair. There’s a deft hand at work crafting a persuasive reason for Microsoft to continue to exist for the long term, and he’s established the culture and execution focus needed to make it real. It’s still early days of course, Microsoft’s decline was a decade in the making, and it remains to be seen whether Microsoft can achieve the near impossible and attract back the army of talented software developers who now support iOS and Android, but here too Microsoft is innovating. There’s probably no company on earth with the depth of cross platform application development capabilities that Microsoft has and we we live in a cross platform world. I predict that within a year Microsoft will provide first rate tooling for iOS and Android development and that support for their own Universal App platform will be integrated and easy. If they achieve that trick then they stand a chance. It’s a complex, many faceted strategy, grounded deeply in the business reality, but also focused on the way many people want to live, not within a closed Apple or Google eco-system, but in an open, vibrantly innovative one that gives them choices. Personally I’m still and iPhone user though because for me the phone is all about the hundreds of specialist applications that I depend on while travelling and there iOS is still king. When I want to get work done though I still turn to Windows. One of the few things that I miss now that I’m retired is being deeply immersed in the battleground for users hearts and minds that’s playing out between Microsoft, Google and Apple, but it’s still nice to watch from the side-lines! 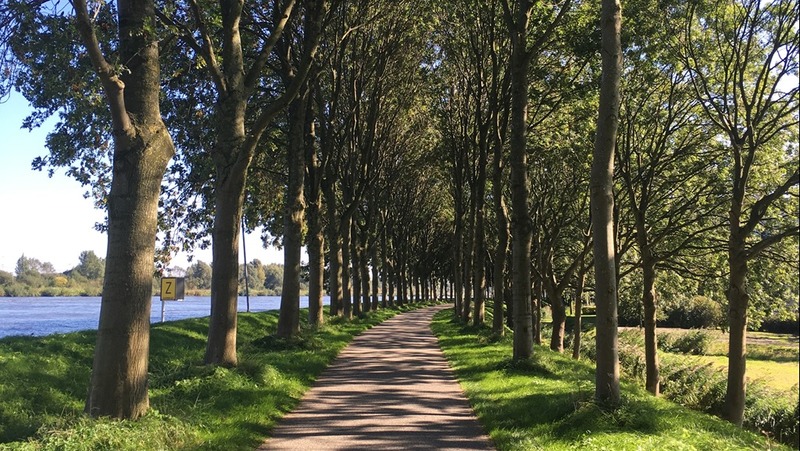 The photo for today’s post came from my recent holiday in Amsterdam, the long and winding path that lies ahead. I’m writing this in Caffe Nero on my trusty Thinkpad x230 and the sun’s just coming out after a squally morning, so I’m off for a bike ride.